The Chicago Bears will look rebound in week 14 when they host the Los Angeles Rams on Sunday Night football following an overtime loss to the New York Giants. With their record at 8-4, Chicago will look to clinch its first winning season Sunday night for the first time since 2012. Although they have twice as many wins than losses this season, it’s the losses that truly demonstrate how good of a team they are. In their four losses this season, Chicago has lost three of their games to Super Bowl-winning quarterbacks in Aaron Rodgers, Tom Brady, and Eli Manning. Rodgers and Brady are viewed as the two best quarterbacks of this generation, while Manning has won two Super Bowl titles himself. Between the three quarterbacks, they have combined for eight Super Bowl titles. Against the Packers in week one, It was a tale of two different halves as the Bears dominated in the first half leading 17-0 at the end of second quarter with Rodgers sidelined. In the second half, it was the Packers who dominated solely due to the career-defining performance by their future hall of fame quarterback scoring 24 points. Their next loss which took place in week six on the road against the Miami Dolphins one is their only loss this season to not have been at the hands of former Super Bowl-winning quarterback. This loss was similar to that of their first loss as they blew an 11 point second half lead. Dolphins wide receiver Albert Wilson had a career day scoring touchdowns on plays of 43 and 75 yards in the fourth quarter. The game would come down to literally the last play of overtime as the Dolphins won on a field goal 31-28 as time expired. The following week they would fall at home against Brady and the New England Patriots by a score of 38-31. Chicago did hold a 17-7 lead midway through the second quarter only 31 points after that point. The Patriots scores were aided by a Cordarrelle Patterson 95 yard kickoff return and a blocked punt returned for touchdowns. Mitchell Trubisky had one of his worse passing games of the season as he struggled with accuracy and was intercepted twice. In their most recent loss against the Giants, it was the team’s all-around worse game of the season and they still had a chance to win the game late in overtime. New York scored touchdowns on an interception return, a wide receiver pass play, and a breakdown in coverage in a goal-line situation. The Giants also had the eventual Offensive Rookie of the Year winner and possible All-Pro in rookie running back Saquan Barkley. A key stat in all of the Bears losses has been their inability to prevent a big scoring play. In all of their losses, they have allowed five scoring plays of 43 yards or longer. In their eight wins, the longest scoring play the team has allowed has been 35 yards. Chicago has also led by seven points or more in all, but one of their games this season. It is impressive that the Bears have yet to lose a game this year where they were dominated from start to finish. Equally impressive has been their resiliency as all of their losses have been by one possession scores in which their offense had a chance to tie or win the game at the end of regulation. 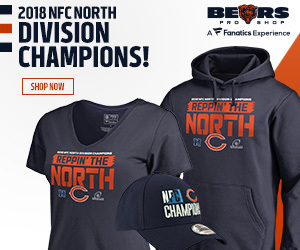 Chicago has come a long way under first-year head coach Matt Nagy as he has led the team to as many victories as they had the previous two years combined. With four games left, the team can still have its best winning record since the 13 wins put up by the 2001 team. Although the losses are demoralizing, they still deserve to be acknowledged as the Bears losses in 2018 have come in truly unique situations.